Always keep yourself up to date, to ensure maximum operational efficiency for every Keyline customer. This is the motto of Liger, the software developed by Keyline for the management of electronic key cutting machines. 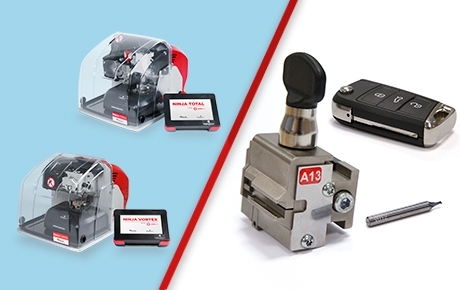 With the update 2.46.0 - DB 2.22 for the key cutting machines Ninja Total and Ninja Vortex, the clamp A13 (OPZ10618B) has been developed for the new Volkswagen® systems which works with the cutter V012 (RIC05274B). Also, the user can now manage the clamp C07 (OPZ05807B) for the Pfaffenhain® keys. The key database grows with the addition of numerous references including Klaus® keys for the Keyline electronic key cutting machines. Click here for the new keys for 994 Laser. Click here for the new keys for Ninja. Click here for the new keys for Dezmo. Click here for the new keys for Ninja Laser. Click here for the new keys for Ninja Total. Click here for the new keys for Ninja Vortex.